Grand Exhibition Organizing an Event of Wedding, Lifestyle and Fashion for Everyone. This event is held for two Days 27th January 2018 and 28th January 2018 at Bhavnagar City. It’s a Festival of Shopping with Good vibes. Grand Exhibition the Festival of Shopping invited you for Wedding and Lifestyle Shopping. Rajvee Creation 2018 Organizing an Event of Shopping Festival in Bhavnagar on 27th and 28th January 2018, at 10:00AM. Enjoy Shopping with Music and Good vibes at Grand Exhibition in Bhavnagar. 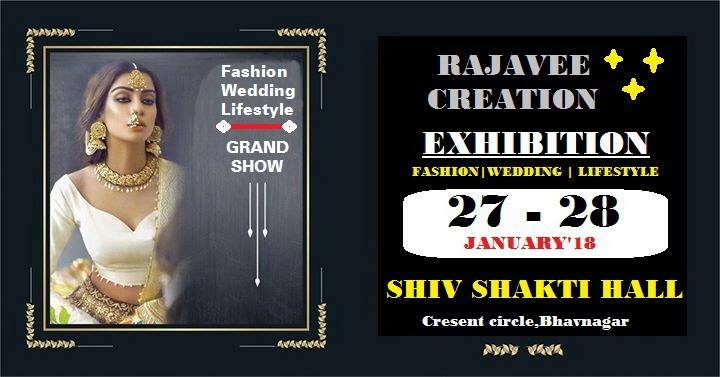 The Grand Exhibition Event is organized by Rajavee Shah for Wedding, Lifestyle and Fashion for making your weekend Happy. So, Hurry Up!! Make Your Weekend Happy with Grand Exhibition & Shopping.